Not everyone likes babies. I was checking out at Target and Baby Shife had himself a few snacks while we were shopping. I gave the lady behind the counter the wrappers and boxes that were molested by my son, and she looked at me like I was handing her the AIDS virus. Maybe she was a germaphobe but she did a few other things while were paying that led me to believe she isn't a big fan of little ones. Either that or someone with Harry Potter skills put a douche bag spell on her. I heard that one thing men from Arkansas can't do to help them fall asleep is count sheep because they get boners. I watched the Real L Word on Showtime and discovered who is a pant and who is a pump. Someone needs to write this to our dear friends in Nigeria, "Dear Nigeria. You have won the World Cup! To collect your trophy, please kindly submit your bank account number …"
Speaking of The World Cup, I hope you are enjoying it. I know a lot of people find it boring and are turned off by the flopping, but if you watched the US game against Algeria then you know why people like myself enjoy watching soccer. If you were like me, you were on pins and needles, chance after chance thwarted, all hope seemed lost, and then in the final moments an amazing goal to win the game and send the US on to the next round. It is called the beautiful game for a reason. I really, really should consider retiring from softball. Here is a picture of my latest boo-boo. Not quite as nasty as this one, but still quite pretty if you ask me. 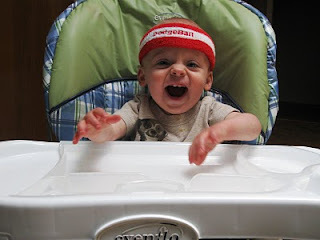 Finally here is a picture of the little man who is in training for competitive eating. Right now he can polish off 1 hot dog in about 10 minutes. lol ouch buddy..watchyerself out there eh!..have a great weekend..glad to see your'e still around and kickin!! Either that or someone with Harry Potter skills put a douche bag spell on her. Hey that's some bruise, I thought softball was what it said ... soft! Great image of the little man, I can't get enough of them, you know. He looks so happy I'd just hate to purloin his hotdog...grins. Doggy tales change on Saturdays, part 3 coming up. I'm working on part 5 right now but wondering if it's time to stop. Dude, you're hurt more often than Greg Oden. Mostly I love Baby Shife. Give him here! I want to kiss him! i love the nigeria world cup idea. i love anything connected with the world cup especially the meltdown of those snobby euro trash french and italian teams. I have enjoyed the World Cup off and on. I am so glad that I did get the thrill of catching that miraculous goal! WOOT! How can anyone look at your boy and not smile? Mystifies me. You are a man of many colors! Ouch. "People who don't like kids should be locked up..."
Um, let's visit that a sec. It's not so much the kids fault as it is sloppy parenting so technically my beef is with undisciplined parents. Good to see you bring your 'A' game back to the blogosphere Shife. 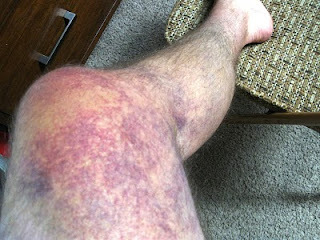 And stop playing softball unless you like going around all swollen and purple and yellow like some bloated LSU mascot. It's just not a good look. Love the Bloated LSU mascot comment!!! ROFL!! @ Shife You are to hit the ball not let the ball hit you! Be safe... take lessons from DG!! 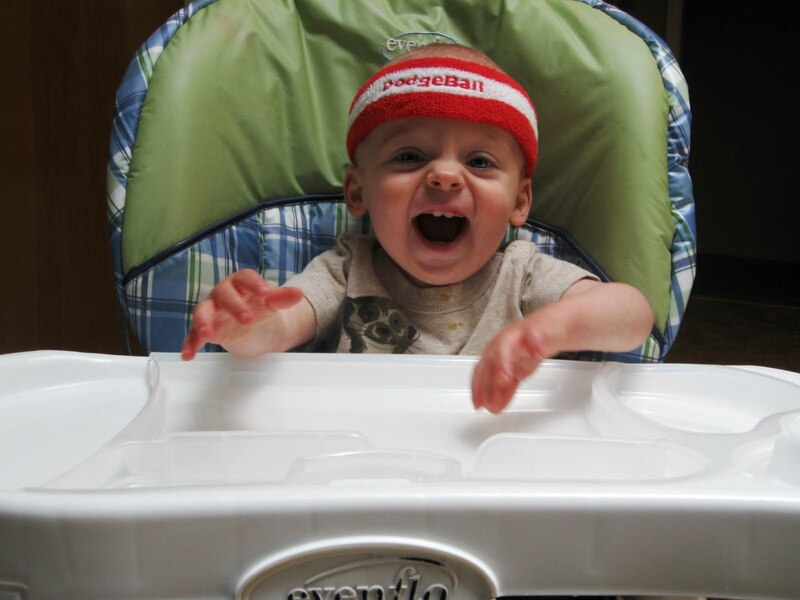 Your lil guy is soooo stinking cute! Love that he'll eat a hot dog. Can he train my boy??? Can't get him to each even one! Take it easy and thank you for stopping by the ole blog! When I start going bald, I'm just going to use spray paint. Why'd you have to mention sheep? Now I'm all worked up. Oh well, there's a big family reunion today, maybe I'll get lucky! Isnt' it great!! What a game! I know you are watching US and Ghana today! Have a great one Shife! That's some cutthroat softball you must play up there. That looks painful. Hope you're better soon. Little man is growing up!! And thumbs down to the lady at Target. OUCH! Yes, you definitely should consider retirement. Holy geez, shifer! LOVE that picture of Baby Shife. Too funny!